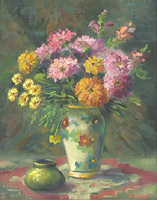 Selden is considered one of the premier Cincinnati Impressionists. She was one of Frank Duveneck's favorite students, and she painted his portrait at his request shortly before he died. She also studied internationally, including with William Merritt Chase. Two old French exposition labels on reverse, including the artist's address at 80 rue d'Assas, Paris. 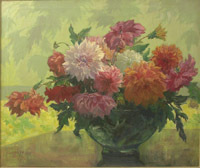 Nourse was very successful in the Paris Salon, acclaimed by both her fellow artists and the public for her technical skill and unique personal vision. 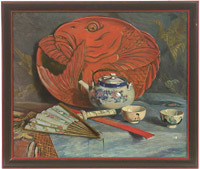 The National Musuem of American Art exhibited a retrospective of her career in 1983. 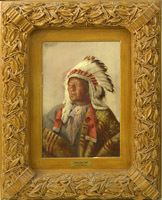 Hauser is well known as a painter of Native Americans. He studied at the Cincinnati Art Academy and the Munich Academy. In 1901, he was formally adopted into the Sioux tribe and given the name Straight White Shield. The model for the Indian head nickel was a composite of Chief Iron Tail and Chief John Big Tree, Iroquois. A student of Thomas Noble and Lewis Lutz and the Cincinnati Art Academy, Caroline Lord also studied in New York and Paris. While in Paris, she worked with Elizabeth Nourse and exhibited at the Salon. She later taught at the Art Academy for over 25 years. 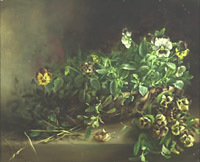 Meurer is best known for his still life paintings, and is considered the last link to the heyday of the trompe l'oeil style. 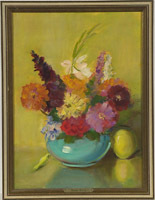 He later broadened his subject matter to landscapes, in part due to harassment from the government for unlawfully reproducing money in his still lifes. He was good friends with Frank Duveneck, and also studied under Thomas Noble and L.H. Meakin. Lord Baltimore is a well-known figure in Western lore. Well-known painter and Rookwood artist John Rettig studied under Frank Duveneck and Edward Potthast. Elizabeth Alke is a widely exhibited artist. She studied under Thomas Noble and Caroline Lord, and was the first woman to win the Ingalls Scholarship at the Cincinnati Art Academy. She was married to artist Stephen Alke. Also referenced as Charles John Arter, this artist studied in Cincinnati and Paris, and had studios in Venice, London and New York. Pope Pius X and the King and Queen of Italy were among his many famous portrait sitters. 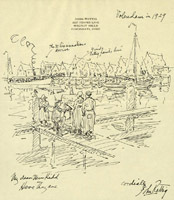 Rettig spent much of the last 30 years of his life in Volendam, Holland. 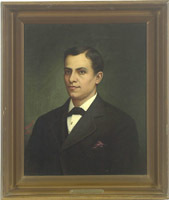 Dumler was a student of Edward Potthast and Martin Rettig. Ashbrook studied under Frank Duveneck and William Merritt Chase, and was an instructor at the Cincinnati Art Academy. Henry Farny, 1847-1916, listed, Game Ahead, 1905, print, 9" x 6"
This French born artist studied and spent most of his life in Cincinnati. After his first trip West in 1881, he became well-known for his Indian paintings. Myers studied at the Cincinnati Art Academy and the Arts Students League of New York. 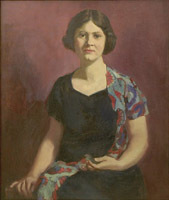 She was a member of the Cincinnati Women's Art Club, Cincinnati Art Museum Association, and the Crafters Guild. 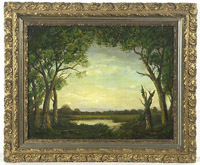 Myers is listed in Davenport's and in the 1917 American Art Directory as a painter of miniatures. Student of Frank Duveneck and brother of John Rettig, Martin had a long career as a painter and decorator for Rookwood Pottery. Signed Etchings From the Library Walls: E.T. Hurley: Skyline of Cincinnati 1880s, 7" x 10".. Paul Ashbrook: Christmas Greeting, 10" x 8"; Christmas Wishes, 9" x 6"; Towne Crier, 5" x 3"; Old man with cane and hat, 9" x 7"; Old man with beard, 9" x 7"; Mexican with sombrero, 9" x 7"; Begging man with hat, 9" x 7"; Mexican man with donkey, 9" x 7"; Fisherman with net, 9" x 7"; Man playing cello, 10" x 8"..